The G2420T Streamliner Hollow Body Single-Cut with Bigsby is designed for the modern guitarist who yearns for something beyond the norm. A commanding guitar for powerful players, the G2420T’s modern sonics, updated electronics and authentically elegant style create the latest iteration of That Great Gretsch Sound. A fast-playing 12”-radius laurel fingerboard with elegant pearloid Hump Block inlays and 22 medium jumbo frets sits atop the white-bound nato neck with a thin “U”-shaped profile—ideal for chord work or firing off hot-rodded riffing. 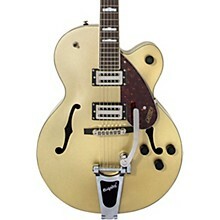 Add some shimmer and expression to your playing with the Bigsby-licensed B60 vibrato tailpiece, while the Adjusto-Matic bridge with secured laurel base and synthetic bone nut grant amazing tuning stability. 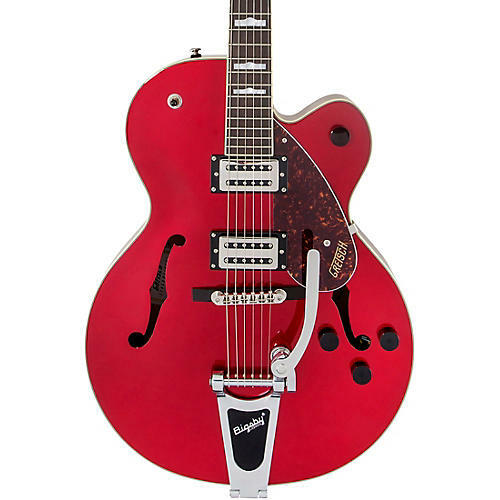 All the classic eye-catching style you’ve come to expect from Gretsch is here—vintage-style black control knobs, enlarged F-holes for increased acoustic projection, elegant aged white binding with upgraded purfling, slick-looking nickel hardware, arched laminated maple construction and three-ply tortoise pickguard. Nearly impossible to put down once you pick it up and start playing, the G2420T is an astounding take on the classic sound and style you’ve come to expect from Gretsch. Case sold separately.